A New Year has begun which will be, according to Ancient Chinese Astrology, the year of the wooden horse. Where we live in Queensland it has begun with a continuing and escalating heat wave, reaching the forty Celsius mark and beyond. Yesterday on our property the thermometer reached 45 degrees Celsius. Crafting has been put on hold for a little while as my energy has gone into keeping water up to the wildlife and trying to save what I can of the garden. 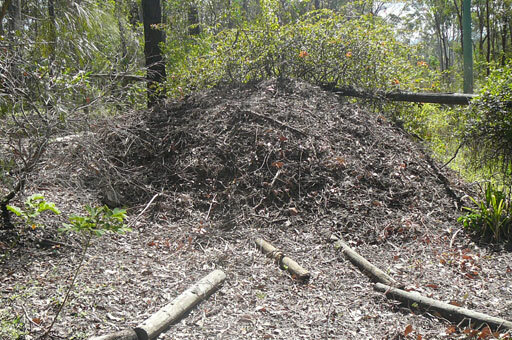 With the male bush turkey removing leaf litter and mulch for his three nesting mounds, it can be a huge challenge. A New Year offers so much potential. It always holds promise for new opportunities and insights. The start of the year is like an empty vessel that is to be filled with experiences and lessons. Although the heat has zapped physical energy, nature is presenting a lot of wonder and inspiration. 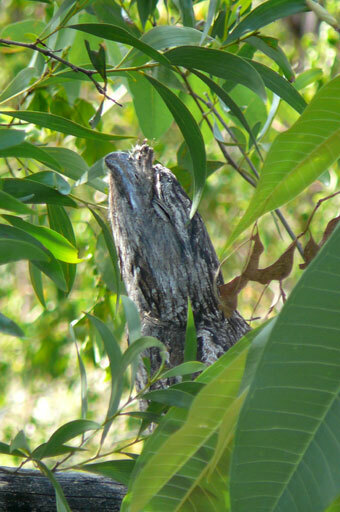 What delight to be greeted by the Tawny Frogmouths who had such drama with the goanna last year. 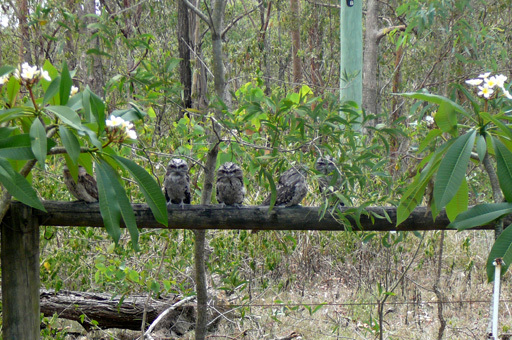 This family group stayed on this fence rail all day, letting me know that they had survived and successfully reared their young. What a message of courage, determination and resilience they bring. These birds are so cleverly marked that when they enact the “I am a tree branch pose ” they really do appear to be just that. This trick of disguise is lesson conveyed to the young as a matter of survival. The young pick up the idea of being a branch very early . 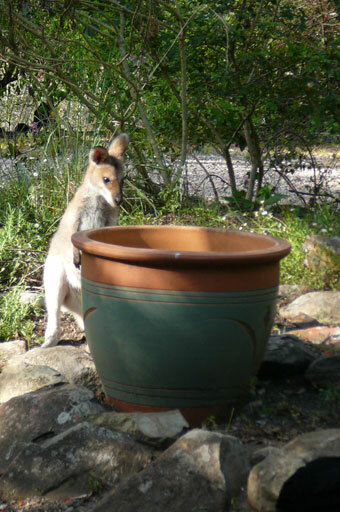 Their markings are so like aged wood and they blend into the bush setting remarkably well. 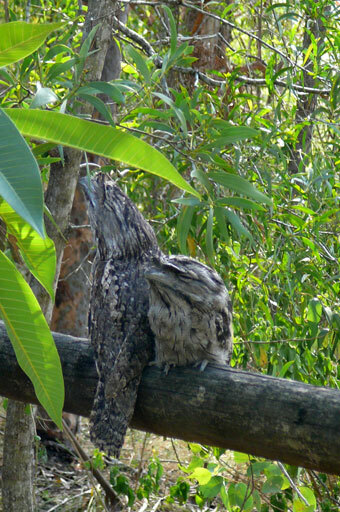 These interesting birds are not actual owls but rather a related species. If noticed by other birds during the day they get attacked. They must have a fearsome reputation in the feathered world. However, I have also been fortunate to observe them when they hunt at night and they seem to mostly catch insects . 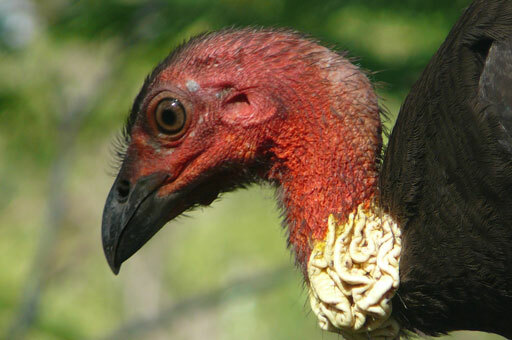 As for the turkey- they are said to only build on mound each year. The one here seems to be a property developer determined to impress the ladies. 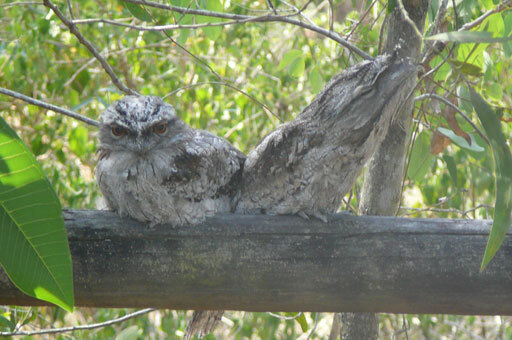 We love the tawny frogmouth and have some in our area of Southern Tas. Just delightful birds. Happy New Year to you. So enjoy getting a glimpse into an unknown environment. Those owls are fascinating.